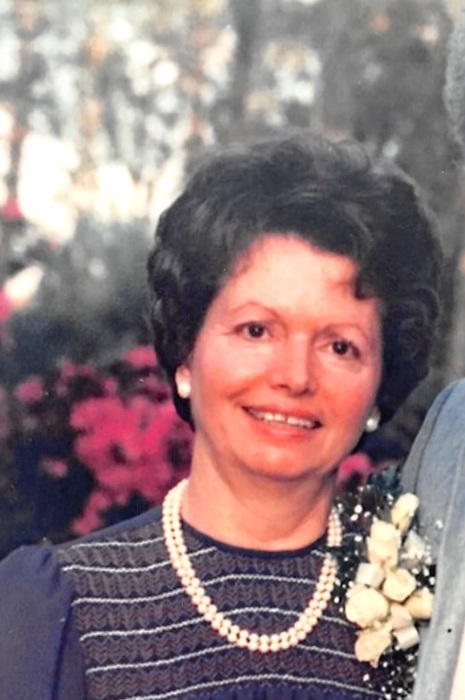 Virginia Theresa “Jenny” Prejean Jones, a resident of Baton Rouge, LA., passed away on Sunday, March 31, 2019 at the age of 90. Born in China, Texas on December 27, 1928 to Philip and Coralie Moreaux Prejean. Jenny lived her young adult life in Beaumont, TX., where she married Edward Bonham Stover Jones on November 9, 1950. Jenny became a working girl, wife and mother when she and Ed moved to Baton Rouge in the late 1950’s. She worked for a number of years at Fidelity Bank and for a time owned and managed Allstate Fence with her oldest son. Although well-suited to the “city” life of Baton Rouge, Jenny and Ed always has a soft spot for Texas and retired to a quaint lakeside home in Gladewater, TX in the late 1990’s. They lived there near Ed’s family and new friends until 2001 when they relocated to Denham Springs, LA. Jenny and Ed were married 61 years until Ed’s death in 2011. Jenny is survived by her sons, Mark Steven Jones, Edward Bonham Stover (Scooter) Jones II and his wife Irene (Jo) Santos Jones, Forest Lee Jones and his wife Carolyn Heaton Jones; Stepdaughter, Patsy Jayne Noonkester brother, Ory Prejea; ten grandchildren and eight great-grandchildren. Fondly known by everyone as “G-Maw”, Jenny will be remembered for her quick wit and dry sense of humor, her cooking skills that ensured no food was left un-done, love of sweets (anything chocolate), affection for beautiful flowering plants and her quirky way of letting you know you were still loved but in the doghouse once in a while. She considered herself to be something of a housing guru and never shied away from trying to improve where she and Ed lived all while “saving money”. G-Maw loved her grandchildren more than anything else and her most favorite times were spent with them swinging in the big backyard, dying Easter Eggs or chasing G-Paw’s dog Sissy at the house in Villa del Rey. Jenny is predeceased in death by her spouse, Ed; sister, Bertie Prejean Schwartner; brothers, Ivry Joe Prejean, Paul Prejean and Hollis Prejean. Visitation will be held at Resthaven Funeral Home, 11817 Jefferson Hwy, BR, LA., on Saturday, April 6, 2019, beginning at 12:00 pm, with services immediately thereafter at 2:00 pm. Pallbearers will be Andrew Jones, Rodney Schwartner, Scott Noonkester, Josh Aymond, Ryan Thibodeaux and Greg Prejean. The family wishes to extend our sincere thanks to family members and friends, especially to Betty Buras Jones Manning and Helene Kaiser Jones Wall who loved her dearly and made her as comfortable as they could in her last few years.